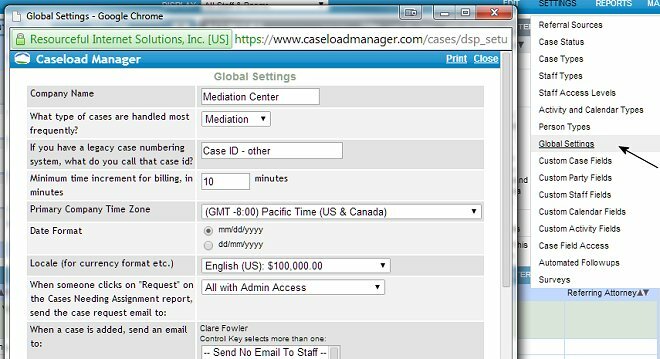 When a new case is added to Caseload Manager, it is possible to trigger an email alerting administrators of the new case. 1) To enable this feature, click on SETTINGS> Global Settings. 2) A new window will pop open (or a new tab in certain browsers). At the bottom of this window, you will see a drop down menu, saying that when a new case is added an alert should be sent to the desired administrator. The alert may be sent to anyone with an administrative setting. Multiple people may be selected by clicking "Command" (on a mac) or "Ctrl" (on a pc). Please note: this feature is either on or off. You may select different admins to receive alerts for different types of cases.